Cafe Zupas' opening soon at The District! I went with my husband and two amazing friends. Even though I had never eaten at a Zupas before, I had heard various family members and rave about the place for years. Needless to say I was all anticipation. Would their food be as amazing as it was purported to be? I am happy to report that their food and atmosphere far surpassed my expectations! Though modern in design their restaurant was warm and inviting. Everyone in our groups decided to go for their $7.99 combo so we could try more than one of their delicious food items. Thankfully they were nice enough to let me sample their different soups when I had a hard time choosing what I wanted to have with my sandwich. I loved the personal touch of fresh bread and complimentary Chocolate Covered Strawberry that came with the meals. Since this was a special occasion (being the parents of small children we don’t get go out to eat often) we decided to splurge and get deserts as well though I sort of wish we hadn’t (Not because they weren’t anything less then divine. Rather because I was so filled with the dinner I had a hard time finding room for more.). • First 50 in line @ 11:00 get their Meal for 1/5 off! • Enter to win FREE FOOD FOR A YEAR! If you live in Utah, Nevada, & Arizona you can have the same awesome eating experience that I did at Café Zupas! Café Zupas has won 18 Best-of-State awards over seven consecutive years and I wanted to see what all the fuss was about! It was my Aunts birthday so I thought it might be a great place to go for a family gathering. As soon as we walked in I loved the atmosphere! Clean, bright, and full of happy helpful staff! I was a little overwhelmed by the options everything looked so good. I decided to get a sandwich and salad (yes I was feeling really hungry ) and as a little surprise it comes with a chocolate dipped strawberry! Yippee! I was also really impressed with their kids meal options. My kiddos got a grilled cheese sandwich that came with a fruit cup as well. Don't even get me started on their desserts! Don't they just look divine? 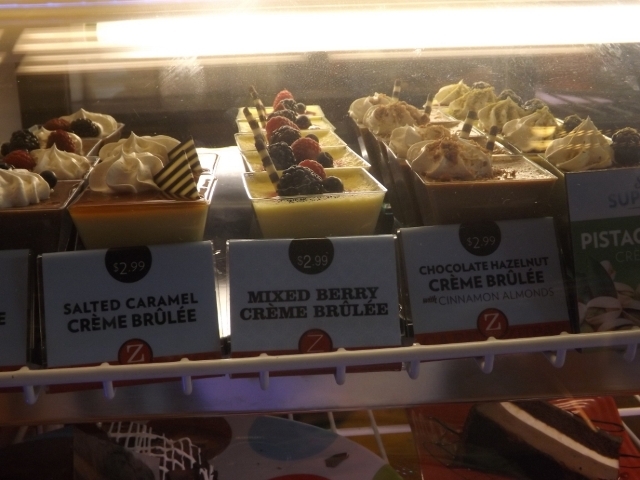 Café Zupas would be a great place to go just for dessert! My hubby and I plan on going back on a little date and trying out a few of the delectable desserts. Café Zupas prices are pretty much on par with most casual dining places. $5 for a sandwich and you can add more items if you like. Café Zupas was definitely the best spot to have a family gathering and a great meal! If you are in Utah be sure to check out the West Valley location they had amazing service you won't want to miss! Whether you’re on your way skiing, getting back from a hike, going out to dinner with the family, or meeting friends for lunch, come in to the West Valley Café Zupas and they'll take care of you! French Fries Reinvented By Smashburger and So Much More! That's right... The Best Fries Ever! They really have reinvented French Fries. I didn't think that could be done. First off they are, hand-tossed with garlic, rosemary and olive oil, which makes for an amazing flavor, but I think the most distinctive feature about them is their size. I have seen small cut fries before, but never like these and somehow I just felt cool eating them. In the case of fries, smaller really is better. Smashburger is "smashing" it's way to the top of the burger chain, so what is the problem? I was recently invited to a VIP party at my local Smashburger, and to say I was impressed would be an understatement. I had never been to a Smashburger so this was a completely new experience for me. I can say that I have heard other reviews (on a normal day) that have stated that they have some of the friendliest employees, and it's no wonder, unlike most food establishments they offer incentives and perks to their employees and only hire those with a big smile and a passion to work for them. I had a a small sample of their shakes and all I can say is YUMMY!! And if you read the pic. above you can see why! That's right... Häagen-Dazs shakes!! I absolutely love Häagen-Dazs ice cream, it's some of the highest quality ice cream you can get! I felt like Oliver Twist - " Please, sir, I want some more" Next time you are feeling like treating yourself, be sure to head to Smashburger. My hubby got the Avocado Club Burger (be ware they also have a chicken sandwich with the same name) I accidentally got the burger when I ordered. Luckily they had no problem taking it back and bringing me the chicken, so make sure you specify what one you want when ordering. He loved his burger, these are never frozen 100% Certified Angus Beef burgers. And if you are wondering about the smashing process, thinking... "doesn't that just make them small and get rid of the juiciness?" I can promise these are large burgers and full of flavor! If you are worried about size you can also get a "Big Smash" considering the normal burger was plenty big enough I don't even want to know how big this sucker is. Once I got my Avocado Club chicken I had filled up on a lot of fries lol, but it looked so good I had to eat it! The "ranch dressing" they put on this is amazing!! I put ranch in quotes, because it wasn't like any ranch I have had before. I wish I could buy a jar of this stuff! Every last bite of the Smash Chicken is juicy and free of any fatty pieces. I would highly recommend getting this, the flavor combinations of the "ranch", bacon tomato and avocado were amazing. About half way through my chicken I looked over to see the woman next to me eating a salad, if that's what you want to call it. For my fellow Seinfeld fans this is the "BIG Salad" Elaine always wanted. This salad ate 4 other salads for breakfast! This picture doesn't even do it justice. Needless to say you can guess what I will be getting next time I go back. My overall opinion of Smashburger? A huge two thumbs up! And for my Utah readers be sure to stop by the Fort Union location for some amazing food served up every day by a super friendly staff. Enjoy! Huge thanks to Smashburger and TSG for the opportunity, and the best chicken & Fries I have ever had!